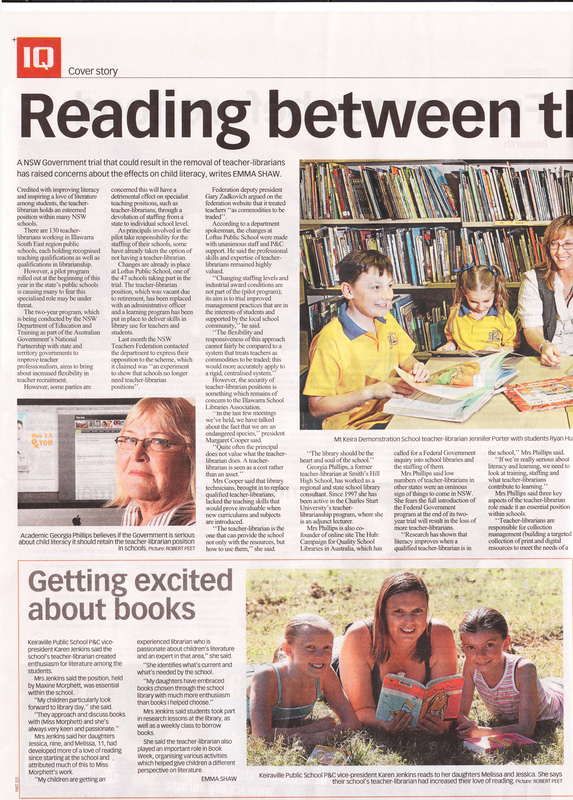 The Illawarra Mercury has responded to our media release concerning the NSW pilot trial of no teacher librarian at Loftus Public School. Their reporter, Emma Shaw, has interviewed two Hubbers, a TL and principal, a parent and the president of our local school librarians’ association. We thank them all for their contributions and enthusiastic support. We’d like to know your reaction to the coverage, so we can improve future releases. Please comment below. Thank you, Mr. Piccoli, for your prompt reply. One good thing about the league tables is that they do uncover the huge discrepancy between government and non-government schools when it comes to staff numbers. You won’t see independent schools trading in teacher librarians (TLs). They understand how TLs help to deliver curricula, collaborate in teaching information skills, directly improve literacy through building and promoting exciting print collections and tailor print and digital resources to the needs of staff and students. At Loftus there was no trading for more “front line” teachers. The principal was trading a more costly, experienced teacher for a less costly one, plus extra admin staff, at the same time freeing up an AP from teaching….not “front line” and not teaching. Meanwhile, 3/4s of Anglican school libraries have budgets over $20,000 (10% over $100,000!). 65% of Christian schools have budgets over $20,000. Almost 50% of Catholic schools have budgets over $20,000 (10% over $50,000). 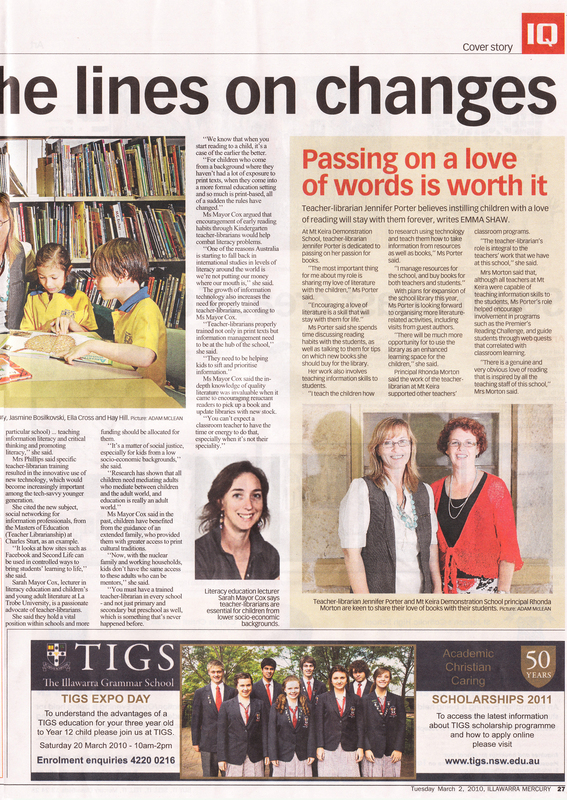 At least in NSW we have had teacher librarians, many part time, in all schools. The staffing formula which supported this must be preserved. We also, do not opposed the National Partnership agreements which are bringing much needed funds into the most needy schools. The conditions of the NPA on Quality Teaching, however, must be changed to ensure that specialist teachers staffed outside of the establishment cannot be lost. Failing this, the NSW Government must make its own provisions to ensure that this cannot occur. Every school deserves a qualified teacher librarian to improve literacy and academic achievement. Thanks for your email about the trial of new flexible staffing arrangements. It seems the Commonwealth are hell bent on imposing market based reforms that have proved to be a failure in other parts of the world. I have taken a firm stance against league tables and have been critical of many of the other measures that Julia Gillard has imposed on schools. I agree that the trial is probably more about covering problems of under funding of schools by allowing Principals to cannibalise what they might see as less essential staff and replacing them with what they might see as more important front line, teaching staff. What this covers up is a lack of funding to keep positions like teacher librarians while also being able to employ additional teaching staff. I support more autonomy for Principals to make decisions about their schools and how they use their budgets but it is very dangerous territory when the government is pressuring Principals to get high NAPLAN results for the MySchool website if they fear they will be measured by those results. This can badly distort what happens at schools when the focus becomes entirely about NAPLAN results. I am in regular contact with the Teachers Federation as well as the Principals groups in NSW and this is an area we have discussed at length. I will continue to consult with them and other groups, such as yourself as this trial continues. Thank you again for your email and please stay in touch. 47 pilot schools in NSW are now trialing the flexible staffing arrangements already in place in the ACT, Tasmania and Victoria. This devolution of staffing and budgets to schools has seen cuts and trade offs which have worsened school library staffing. “Loftus Public School in Sydney’s southern suburbs is a pilot school. When its teacher-librarian position became vacant last year, the principal decided not to fill it. As described to Federation, this ‘change to the staffing mix’ involves employment of a part-time school administration officer and a temporary teacher who is paid at the lower end of the incremental salaries scale. Read the rest of Gary Zadkovich’s article in the NSW Teachers Federation online journal, Education. DET has yet to state what educational improvements are expected to result. On the contrary, we know research tells us that qualified teacher librarians help improve student literacy and achievement. In NSW this has been acknowledged with DET sponsorship of TL training and staffing of school libraries outside of the established classroom staffing. NSW has been a model in this regard internationally. Support NSW teachers in fighting deregulation of staffing and resourcing in public schools. Write to your local MP now. SCHOOL principals have begun axing teacher positions under sweeping powers given to them by the federal Government. A Sydney primary school has abolished its teacher librarian position, as part of a pilot scheme designed to give principals more control over school-based decisions. This landmark case has raised fears that hundreds of other staff will lose their jobs. Loftus Public School principal Martin Sinclair opted not to replace his retiring teacher librarian last year. Instead, he employed a part-time clerical assistant and a temporary, entry-level teacher. The school is one of 47 participating in the program, which lets principals make more decisions on issues such as recruitment, staffing mix and budget. The two-year trial is part of the national partnership agreement on improving teacher quality. The Loftus case is the first example to emerge of a school abolishing a teaching role, but teacher unions fear the move could set a dangerous precedent and lead governments to absolve themselves of responsibility. NSW Teachers Federation deputy president Gary Zadkovich said it had ramifications for every teacher librarian in the State. He warned that it could lead to school counsellors and careers advisers losing jobs.